In 1970, the city of Seattle, King County and Washington state sued the American League for $32 million in damages resulting from the Pilots' move to Milwaukee. Proposals by baseball officials to move the White Sox, A's and Giants to Seattle had caused the case to be continued. When nothing came of these proposals, trial finally convened at the Snohomish County courthouse in Everett, Washington in January of 1976. The question to be decided in State of Washington, et al. v. The American League of Professional Baseball Clubs, et al. were whether the American League was responsible for any loss suffered as a result of the Pilots' move and if so, what was the extent of the loss. For 20 days, baseball owners, concessionaires, sports writers and civic officials took the witness stand. The plaintiffs' main argument was that the American League had entered into a contract with the local governments. This wasn't what we normally think of as a contract, but was a series of actions taken to elicit financial commitments by the local governments and voters. 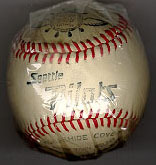 Baseball's actions included promising to put a major league team in Seattle and keep it there if the stadium initiative passed and if Sick's Stadium was expanded as a temporary home. The A.L. was sending players including Mickey Mantle and officials including president Joe Cronin to Seattle to campaign for the initiative, while contributing money to the "vote yes" campaign. Due to these actions, the voters passed the domed stadium issue and Sick's Stadium was expanded. When the American League allowed the Pilots to Milwaukee after only a year, they broke their end of the deal. The state also sued on anti-trust grounds. The owners of the Pilots had originally financed the team with a $2,000,000 loan from Sportservice, Inc., the biggest concessionaire in the world. There was a provision in the loan that Sportservice would have exclusive concession rights for the team regardless of where they were located. However, King County law required competitive bidding for concession rights. According to plaintiffs' lead attorney, Bill Dwyer, the Sorianos and Jack Zander, vice president of Sportservice, had a verbal contract that "if the Seattle Pilots could not take Sportservice into the domed stadium, the Pilots would not go into the domed stadium at all." This, taken with all the steps the American League could have taken to keep the Pilots in Seattle, but didn't, amounted to an illegal conspiracy to move the team to Milwaukee. If this was proved, baseball's famed anti-trust exemption wouldn't have protected them. American League lawyers countered that the only contract that existed was between the league and the Pilots owners. They hastened to add that even if a contract had existed with the local governments, that it was breached it when Sick's Stadium wasn't remodeled to specifications and construction on the domed stadium was delayed. Finally, they pointed out that the decision to move the team was made by the bankruptcy judge, not the American League or Sportservice. During 18 days of exacting questioning, jurors heard testimony from baseball owners, including Oakland A's owner Charlie Finley, who admitted that the American League did nothing to keep the Pilots in Seattle and Kansas City Royals owner Ewing Kauffman, who said, "we sent Joe Cronin out there to help the bond issue pass, and Mr. Cronin, with our authority, stated as follows: 'The American League is in Seattle to stay, given a place to play.' " Baltimore Orioles owner Jerry Hoffberger admitted that he and other owners were negligent by not looking into the finances of the Pilots owners carefully. "Things were going well for us at trial," said plaintiffs' co-counsel Jerry McNaul, "and a lot to our surprise, the American League made a proposal that they'll give us a franchise if we drop the suit. Then it was just a question of documenting the agreement." "Even then, we didn't dimiss the case immediately," added Dwyer. "We provided in the agreement that the trial would be recessed and continued for a little over a year--until the opening of the 1977 baseball season, to make sure a team was out there in uniform, playing baseball." That team, the Seattle Mariners, did just that in 1977, thanks in large part to painstaking legal work by Dwyer and McNaul.